Every downtown needs a champion. Wilson Downtown Development Corporation is that champion for Historic Downtown Wilson. As a Main Street America™ Accredited program, Wilson Downtown Development Corporation (WDDC) is a recognized leading program among the national network of more than 1,200 neighborhoods and communities who share both a commitment to creating high-quality places and to building stronger communities through preservation-based economic development. 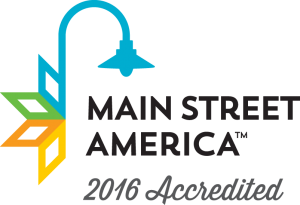 All Main Street America™ Accredited programs meet a set of National Accreditation Standards of Performance as outlined by the National Main Street Center. Create a community-driven public/private partnership that invests in, and supports, an effective and dynamic comprehensive downtown revitalization effort based on the vision and mission. Strategically develop downtown as Wilson’s premier destination for social, cultural, and business activity that increases and supports business activity, social connectivity and commercial sales. Enhance the physical appearance and cohesive aesthetics of downtown to increase financial investment, cultural vibrancy and social cohesion. Facilitate and support existing businesses and new economic growth that aggressively builds on identified economic drivers of southern heritage, innovation, sustainability, diversity, arts, culture and day-to-night activity.